It was the greatest challenge of creative and comedy endurance. 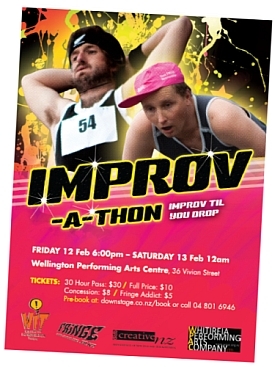 An improv marathon – filled with all the thrills and spills that you have come to expect from Wellington’s finest improvisers. This improv extravaganza ran for 30 hours non-stop on the 12th and 13th of February, at the Wellington Performing Arts Centre, 36 Vivian Street. Two brave audience and seven brave performers held out for the full thirty hours. We salute those heroes . . .and everyone else who took part and helped make it all happen. This entry was posted in Other formats, past shows and tagged Fringe Festival, improv, improvathon on February 12, 2010 by MaDmin.